This is the single most successful racing car ever built by Aston. 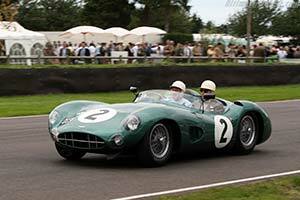 After its victorious debut at the 1957 Spa 1000 km race, it scored five more victories. Most important of all was the win in the 24 Hours of Le Mans in 1959 in the hands of Roy Salvadori and Carroll Shelby. It was campaigned well into the 1962 season by privateers. Beautifully preserved, it is owned by a British collector. Despite the machine's incredible value, he regularly has the car raced in a variety of events. It has been very successful, particularly in the hands of Peter Hardman.